11.12.2009 - Remediation Products, Inc.
As in situ remediation injection contractors and remediation product suppliers for many years, it never dawned on us that putting BOS 100® or BOS 200® directly in excavations to mitigate residual contamination might be a great idea. Some very smart customers started this practice and caught us totally by surprise. Initially, we couldn’t even tell them how much product to buy! What they discovered was that our Trap & Treat® products were just as effective when placed in excavations as they were when injected for plume-wide or specific area treatment. So, why are Trap & Treat® products so desirable for excavations? 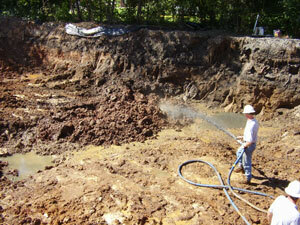 Since then, various methods of treating excavations have been employed. Some contractors have created product slurries, spraying the mixture into their excavations with “trash” pumps; others have placed our products into excavations and mixed them in with back hoes. What is the primary contaminant? What is the approximate concentration? What are the dimensions of the excavation? Is there residual free product? Click here to view a recent TV segment about RPI, and please contact us when you are ready to “Put it in the Hole”!